The metabolites like proline (Pro), Δ1-pyrroline-5-carboxylate (P5C), methylglyoxal (MG), γ-aminobutyric acid (GABA), glycine-betaine (gly-bet) and polyamines (PAs) are known to be shared between and commonly utilized in the aroma production pathway and/or osmotolerance regulation pathway during environmental stress. In the present study, the responses of four popular indigenous aromatic rice varieties, viz. Tulaipanji (TP), Radhunipagal (RP), Kalonunia (KN) and Gobindobhog (GB), to gradually increasing concentration of NaCl were studied against the non-aromatic rice cultivar (IR-64), so as to understand the channelization of the aforementioned common metabolites for aroma formation and salt stress amelioration in the selected rice cultivars. The pattern of accumulation of these metabolites supported by multidimensional scaling and determination of aroma content illustrated that all the aromatic cultivars except KN sequester the metabolites towards aroma production. Immunoblot analysis revealed high accumulation of betaine aldehyde dehydrogenase 2 (BADH2) protein in KN, which is uncharacteristic of aroma production. The BADH2 isozymes were also differentially expressed in the stressed rice cultivars. 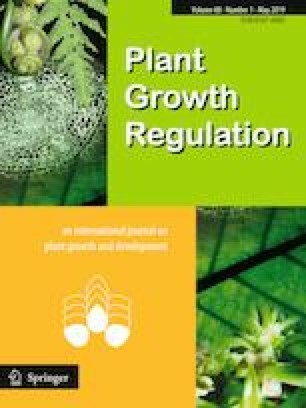 Of all the aromatic cultivars examined, stressed KN seedlings strategically siphoned the metabolites towards protection against salt-induced injuries and exhibited lower aroma production. The present work therefore clearly illustrates the notable differences, observed during the predominant channelization of relevant metabolites associated with both fragrance and stress amelioration in rice, even at the varietal level. Financial assistance from Council of Scientific and Industrial Research (CSIR), Government of India, through the research grant [38(1387)/14/EMR-II], Science and Engineering Research Board, Government of India through the Grant [EMR/2016/004799] and Department of Higher Education, Science and Technology and Biotechnology, Government of West Bengal, through the Grant [264(Sanc. )/ST/P/S&T/1G-80/2017] to Dr. Aryadeep Roychoudhury is gratefully acknowledged. Mr. Aditya Banerjee is thankful to University Grants Commission, Government of India for providing Junior Research Fellowship in course of this work.